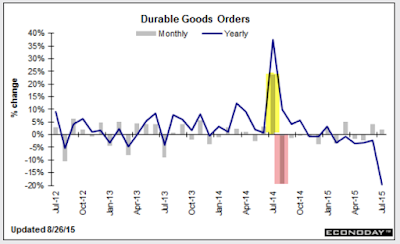 Durable goods orders surged in July, beating the top-end of Bloomberg Consensus Estimates. Despite the surge, year-over-year orders are still in the red. Exports have been weak but they didn't hold down July's durable orders which, for a second straight month, are strong, and strong nearly across the board. New orders rose 2.0 percent in the month which easily beat out top-end Econoday expectations for 1.2 percent. Excluding transportation, orders rose 0.6 percent which is near the top-end forecast for 0.7 percent. Capital goods data show special strength with nondefense ex-aircraft orders up 2.2 percent following June's 1.2 percent gain and with related shipments up 0.6 percent following a gain of 0.9 percent. Motor vehicles led the industrial production report for July and they're a standout in this report also. Orders for vehicles surged 4.0 percent in the month on top of June's 0.8 percent gain. Vehicle shipments are right behind, up 3.9 percent following a 0.9 percent gain. Commercial aircraft, a center of strength for the nation's factory sector, fell back with orders down 6.0 percent following June's 70 percent surge. The good news continues with total shipments up 1.0 percent vs June's 0.9 percent gain which are very strong readings. Unfilled orders rose 0.2 percent while inventories, reflecting strength in shipments, were unchanged. The factory sector has had a tough year, that is up until June when demand for vehicles began to take hold. This report speaks to domestic strength and should help offset ongoing concerns over global volatility. In a special note on year-on-year change, total new orders are down 19.6 percent which reflects an aircraft comparison with the Farnborough airshow in July last year. Excluding transportation, orders are down 2.5 percent which is an improvement vs declines of 4.5 and 2.7 percent in the prior two months. The skew in aircraft orders made the year-over-year comparisons this month (yellow highlight) especially tough. Next month, the year-over-year comparison (pink highlight) will be especially easy. Discounting the huge swings, this is the first time durable goods have had consecutive month-to-month gains in a year. Once again autos lead the way. I keep wondering how long that can possibly last.